Building a sunroom is a good decision to make when your family needs more home space. A versatile home addition like sunroom can give more living space for families that don’t want to move to new location for getting bigger house. Surrounded with large windows, a well-designed sunroom allows the whole family enjoying the outdoor view and abundant natural light while still shielded from the unpleasant weather. For Melbourne residents, the hottest temperatures in summer are usually in January and February when temperatures can reach over 30°C (86°F). 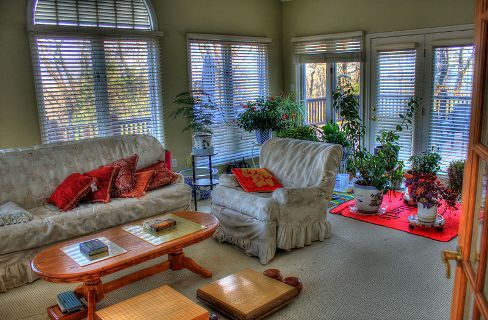 It is not a mistake at all if you opt for carpet to cover the floor in the sunroom. Carpet can give comfy and cozy ambiance; therefore you choose it as you want to provide your family with a comfortable and relaxing added space. What is more, carpet floor doesn’t heat up during hottest months and it keeps your feet warm in the winter. The outdoor carpet tiles or the latest types of labeled indoor/outdoor carpet that stronger against the weather could be your best choices. Your sunroom will be exposed to sunlight; thus the chosen furniture should also be able to bear the common UV rays. Since you have chosen carpet for the sunroom, there are things you should do as precaution to prolong its life. Plentiful sunrays over time might cause the fading of the carpet color. If keep untreated, the direct UV rays can weaken the fibers and the sun faded carpet will be easily broken. You don’t want those to happen, right? Unfortunately, as said by the experts that offer carpet repair Melbourne; the majority of sun faded carpet can’t be repaired to look new again. In this case, as mentioned before, precaution is the best thing to do. You can keep the carpet good look longer by reducing the sun exposure to it. - Install the blinds or blackout curtains which made out of a foam-backed fabric to block much of the direct sunlight through the window. Close it whenever you don’t want brightest sunlight hitting the carpet and the sunroom is not used. -Tint the sunroom windows. A thin solar film applied on the window surface to assist block out UV rays from the sun and control the heat flow through the windows. -Hire carpet cleaning service from trusted local companies in Melbourne like Jena’s to hold up the color fading issue by applying regular protective treatment to guard the carpet from UV damage, stains and mold.